Tropico 6 requires more polishing and it's release date is being pushed, yet again, by another two months. Last we've heard the game was to be released in January 2019 and now this has changed to 29th of March, 2019. Date change was announced today by Simon Hellwig, Owner and Managing Director of Kalypso Media Group in an open letter to Tropico fans. In his statement he tells us that he share beta players concerns that the game is not "outstanding" and he believes that this is still achievable, but requires additional work. This is the third time the release is being pushed further away. Initially the game was to be released "sometime in 2018", then it' has been postponed to January 2019. 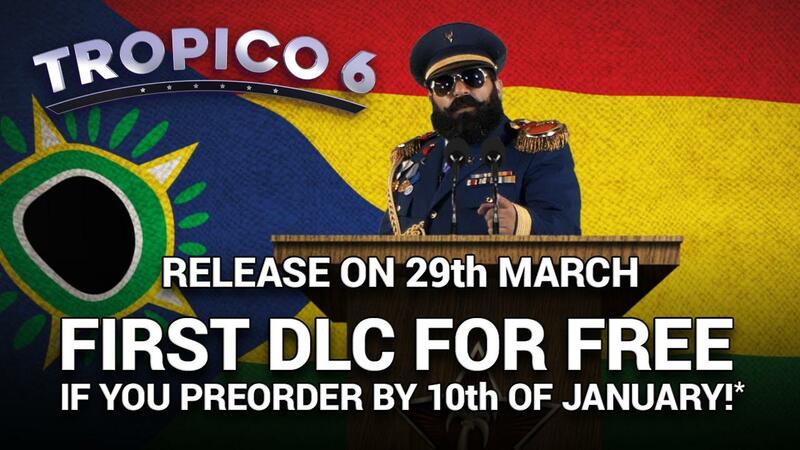 They say three time's a charm, so lets hope that new release date for Tropico 6 is the real one. A proper dictator would either get rid of people who don't agree with their view or... bribe them... I mean offer bonuses. Kalypso understands the disappointment of fans and has offered first DLC for free to everyone who preorders the game by 6pm UK time (7pm CET) January 10th. Additionally may I remind you that the game is 15% off for preorder.